America West Airlines (IATA: HP, ICAO: AWE, and Callsign: Cactus), operating as US Airways, is one of the United States' ten major airlines. The airline is based in Tempe, Arizona and is a part of US Airways Group. The airline maintains two hubs, one at Sky Harbor International Airport in Phoenix, Arizona, and the second at McCarran International Airport in Las Vegas, Nevada. It is the second largest low-cost airline in the US. America West provides service to approximately 100 destinations in the US, Canada, and Mexico. Service to Europe is provided through code sharing arrangements. As of March 2005, America West operated a fleet of 140 aircraft with its only maintenance base in Phoenix. America West Express is the name for commuter and regional flights operated by Mesa Airlines for America West Airlines. The America West Express fleet consists of 43 aircraft. On May 19, 2005, America West Holdings Corporation announced it would merge with the Arlington, Virginia based US Airways Group. The new entity is named US Airways Group and is headquartered in America West's former corporate offices. The merger was completed on September 27, 2005. When the airlines are combined in 2007, they will fly under the US Airways brand. Beginning January, 2006, all America West flights are branded as US Airways, along with most signage at airports and any other printed material. One of the 1980s' greatest business success stories, the airline was established in February 1981 and started on August 1, 1983 using three Boeing 737 aircraft flying out of their base in Phoenix, Arizona with Ed Beauvais as CEO. At the start, you could buy tickets on board the aircraft. The airline quickly expanded, with 11 737s operating flights to 13 cities, developing a secondary hub in Las Vegas, Nevada by the end of 1983, and in 1984 grew to 21 aircraft and 23 cities. America West was one of the first airlines to use extensive "cross-utilization", in which employees were trained in a variety of airline jobs, such as pilots trained in dispatch, and both baggage handlers and flight attendants being trained as gate agents. 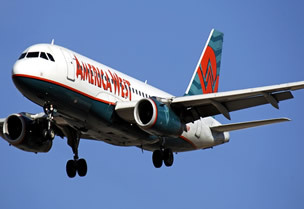 America West also started as a "full service" airline, in contrast with Southwest Airlines, the discount air carrier competing in many of the same markets. America West also utilized an aggressive employee stock ownership program, in which new employees were required to invest 20% of their salary in company stock, providing a steady flow of cash as the company grew. In 1985, America West had grown to the point that no more gate space was available at Sky Harbor International Airport. While the new Terminal 4 at Sky Harbor was approved in 1986, it became apparent that additional gates would be needed before Terminal 4 was completed, and a temporary concourse was added to the southwest corner of the Airport's Terminal 3, adding six gates (eventually a total of 11 gates by 1990) for the use of America West. The airline's rapid growth continued in 1986, with the airline greatly expanding its fleet, primarily with Boeing 757s purchased from Northwest Airlines after Northwest bought out Republic Airlines, as well as the acquisition of a number of De Havilland Dash 8 aircraft for local service from Phoenix and Las Vegas. Also in 1986, the airline started running red-eye flights from Las Vegas to increase aircraft utilization. The rapid growth of America West resulted in large operating losses for the airline, and by 1986 the company was on the verge of bankruptcy. Originally slated to occupy the vast majority of the gates in the under-construction Terminal 4, America West had to reduce its commitment to the city of Phoenix to just 28 gates, with the growing Southwest Airlines agreeing to lease the remainder of Terminal 4. Despite revenue problems, America West continued its growth, with a rebuffed attempted buyout of Eastern Airlines "shuttle" division in 1988. In 1989, the airline purchased four Boeing 747 aircraft (formerly operated by KLM), offering service to Hawaii and Nagoya, Japan, as well as an expansion of service to many Mexican destinations. In 1990, the airline moved into the new Terminal 4, and also took the delivery of several Airbus A320 aircraft, which had originally been ordered by the now-defunct Braniff Airlines and were sold to America West at a steep discount. Despite these developments, the airline continued to lose money. The operating expenses at the new Terminal 4 were much larger than previous expenses in Terminal 3's temporary concourse. The Nagoya, Japan route was essentially a bust (the planes were flying with almost no passengers), with extremely low ticket sales. Finally, concerns about stability in the Gulf States in the lead-up to the Persian Gulf War lead to increasing fuel costs. This combination forced America West to file for bankruptcy in June, 1991.